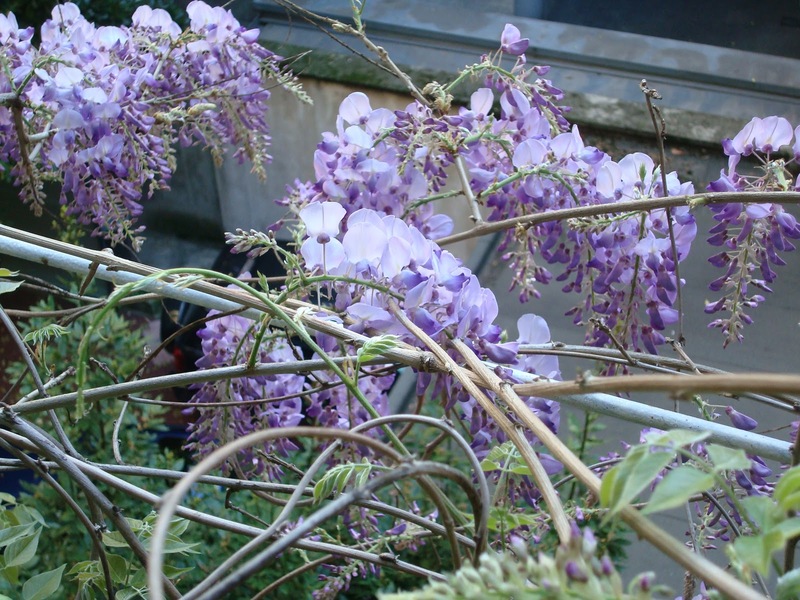 Spring has sprung, or rather, spring has exploded. Temperatures have shot up to 27°C and we all spent the week end outdoors in short sleeves and summer shoes. This is by no means normal for this time of the year, we were still wearing jackets and coats last week. I am pretty sure temperatures will drop soon again so I am enjoying every minute of it while it lasts. This is what has been happening outside my kitchen window while I have been cooking. Now, enough blabbing about the weather. There is much to say, so I better get on with it. First of all, despite some technological problems, the bake sale for Japan was a success beyond expectations. We collected more than three times the initial target, with a whopping US$8269! So thank you first and foremost to Sabrina and all of you bidders. 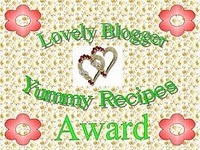 Thanks for the support on Twitter and Facebook, thanks to all the bloggers who baked and cooked up such fabulous treats. And finally, thank you to Second Harvest Japan for the work they are doing on site to help the earthquake victims. Once again, and I cannot say this enough after a few personal experiences these past couple of weeks, it always amazes me how the foodblogging community gets together to help and support each other in good times and bad. 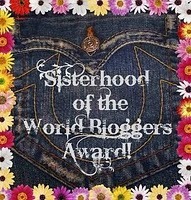 On this note, I would like to thank Manu for the lovely awards for my blog and would like to pass them on. There are so many great blogs out there and amazing people behind them, so it is really hard to make a choice. 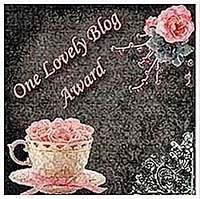 I decided to pass these awards along to some of the newer blogs I have discovered. So here's to you: A Bucks County Kitchen, And Baby Cakes Three, Brown Eyed Baker, Burp and Slurp, Design Wine and Dine, Dulce Delight, From Donuts to Delirium, Indian Simmer, Labna, Life's a Feast, Like Mother Like Daughters, Moomser, My Fiance Likes It So It Must Be Good, My Kitchen in the Rockies, Taste of Beirut. Now let's get down to cooking. I will never forget the first time I visited Sicily right around this time of the year. I was amazed by the three-wheeled Ape Car I kept seeing all over selling mountains of artichokes. This recipe takes inspiration from the typical Sicilian way of preparing artichokes and I first tasted it at my mother in law's. My recipe is a quicker version with fewer ingredients. 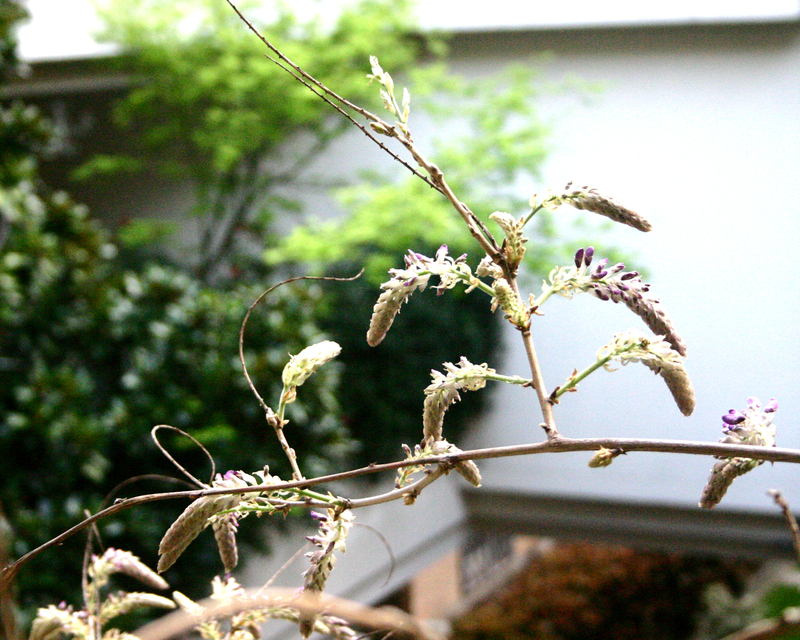 Also, I used carciofi romaneschi, which do not have thorns, are slightly bigger and have a more rounded shape. These are unbelievably easy to make and very tasty: you will get that perfect combination of bread, parsley, garlic and oil with every leaf. 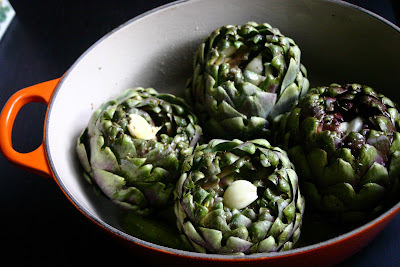 Cut off the stems of the artichokes and set aside. Take off the outer leaves and cut the tops if you are using the thorny variety. Slightly separate the leaves with your hands. For the bread crumbs I used taralli, because I had an open pack I wanted to use up, crushed directly in their bag with a rolling pin. If you are using bread crumbs, you can slightly toast them in a pan. Heat up some olive oil (re-use the same pan so you have less washing up) and a few cloves of garlic. I crushed mine, but kept them whole because I did not want the garlic flavor to be overpowering but the original recipe calls for minced garlic. Pour the garlic oil into a bowl and add a cup of white wine, the bread crumbs, salt, pepper and freshly chopped parsley and mix well. Place the artichokes in an oven proof pot with a top and preheat your oven to about 220°C. Peel the stems you set aside with a peeler and add them into the pot. With a spoon, douse the artichokes with the oil and bread mixture. Bake the artichokes covered for about 45 minutes and another 15 minutes uncovered. You can make this dish adding any ingredient you like: try chopping up capers and anchovies or even sundried tomatoes to mix into the flavored oil. 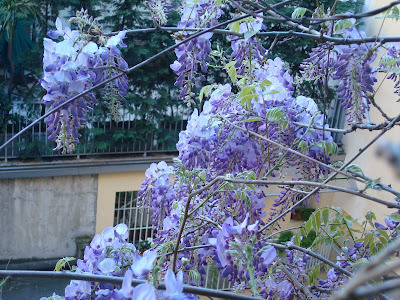 Oh, thank you so much for mentioning me in this great list of blogs and bloggers! I love awards (who doesn't?) and I thank you much! 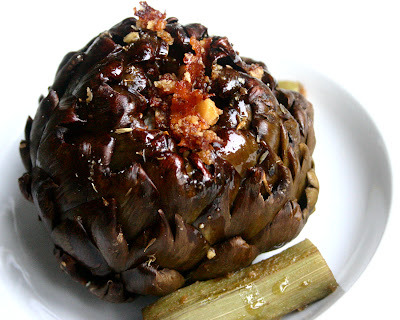 And I love artichokes and this is one recipe I have never had! I miss living in Italy where there are so many fabulous ways to cook and eat artichokes! Delicious! And I always got a kick out of the Ape! Did you ever see Nanni Moretti's film Caro Diario? You must! You're such a star, sweetie, thank you! Thank you!!!! XOXO I love your blog too! What a great way to begin my Monday morning after an exhausting weekend!!!! I can't believe how much we raised. It's so exciting! Although it was over so quickly and I really wanted to promote it on my blog. Ooh thank you!! I feel honored to be awarded. You made my day! 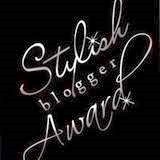 Thank you for the blog award. Just love the artichoke recipe. You know the way to my Sicilian heart. Hi - thank you so much for including me in the awards! It's an honor! We were away this weekend so it was a treat to discover your post after a (dreadful delay) on our flight. 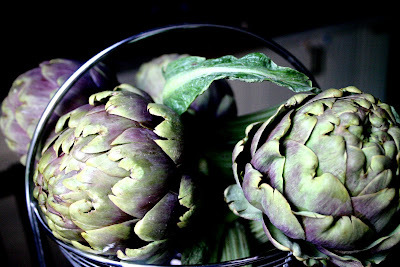 Love the artichokes, I'm going to try your recipe this week! The artichokes look fabulous! They're one of the things I ma truly looking forward to on my trip to Itlay in a few weeks. Jamie - It was a pleasure, your desserts, words and photographs are so lovely. Artichokes, Nanni Moretti and Ape cars, such a part of Italy, no? 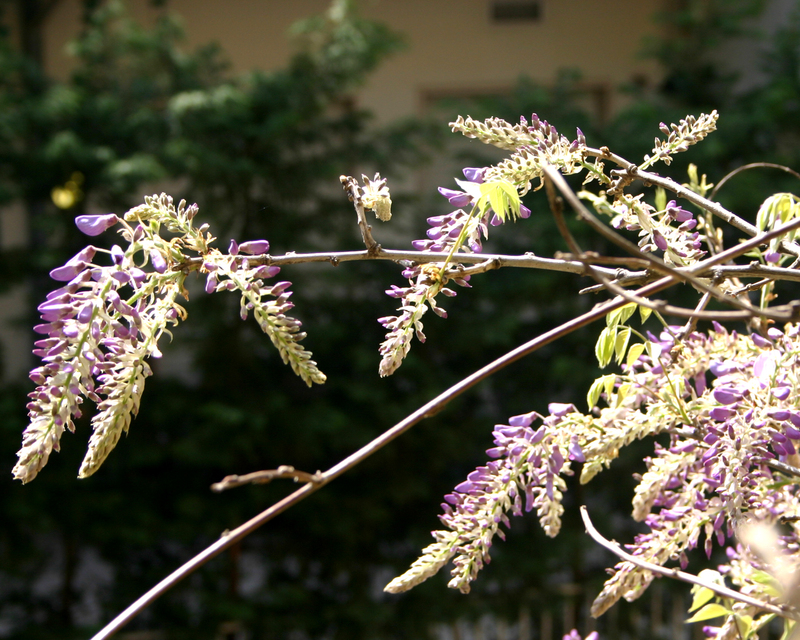 Jasmine - tutto merito tuo! Moomser - Glad to help out with the stupid diet. This award was for your hilarious and touching posts, not that I don't enjoy your recipes and your new found decorating skills. DD&W - There goes the telepathy again! Lorraine - I know, it really came and went in a second. But we reached and exceeded our target, so that is what counts. Sophia - I love your take on life. Promise me yu will try making an artichoke, your ideas are so original. I would love to see what you do with it. Kelly - You are more than welcome. And I will tell my mother in law that you liked the recipe. Manu - I hope you enjoy. 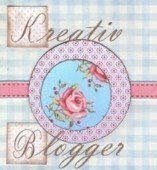 Thanks to you I discovered new blogs and I hope the chain just goes on and on. There are so many out there, it is a pity not to be able to read them all. I would love to learn your mom's recipe for these. There are so many variations. Nicole - I really enjoy your blog and am already looking forward to the English recipes you will be trying out soon. Although it makes our hopes of meeting a little lower...peccato. Andrea - you are coming over? Whereabouts? 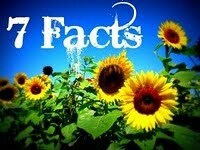 I'm honored to be mentioned in your list of bloggers! Thank you so much! I've never cooked with whole artichokes before, but I definitely need to get started! This recipe sounds so delicious! Thank you so much for the mention in the list of awards; I feel honored. As far as artichokes are concerned, I have had the best of my life in Italy, decades ago, at the home of family friends in Como. We ate baby artichokes whole, they were pan-fried I believe in the same ingredients you are using today and I was in heaven! Great recipe, a classic. Peggy - glad it made you smile. You must try cooking artichokes, it is much simpler that you would think. ToB - welcome, love your blog. That recipe soun delicious, already thinking of where I can get baby artichokes. Perhaps they were stripped down regular artichokes? I love the look of this recipe and I think Mr. Smith might even try them...I have had a lot of luck getting him to eat new vegetables when I roast them. Quick question about the eating part - do you still take apart the leaves and eat the ends, or do you just strip down to the heart? Let me know and I will figure out just the right way to get them to the table. Happy Weekend! Mrs. Smith - You eat the end of the leaves (that is where the bread mixture will accumulate) and then the heart. The traditional way. Let me know if Mr. Smith converts! Thanks so much for the award daaahling, I am so honoured that you would consider me :D. Sorry its taking me so long to stop by, havent been feeling well and took a break off the computer, but I'm back.